You have reached a decision to get a divorce in Orlando. You are filing for divorce in Orlando and have many questions about how to do it. What is the process? How much does it cost? Filing for divorce in Orlando is similar to filing for dissolution of marriage other jurisdictions, and the pricing is comparable or the same. The primary difference is the way the court in your jurisdiction handles the divorce process. Orange County Florida has its own unique policies and procedures because each judge runs her courtroom differently. The same is true for Osceola, Lake, Seminole and Hernando County. Whether you need to hire a divorce attorney in Orlando, or just want some general guidance on filing for divorce in Orlando, call the Jacobs Law Firm, we will be happy to speak with you. Filing for Divorce in Orlando, What Do You Need? Choosing the right paperwork to file in your Orlando divorce case is not easy. This is because there are different kinds of divorce. There is simplified dissolution of marriage, dissolution of marriage, dissolution of marriage with minor children, dissolution of marriage with relocation, and the list could go on. It is generally true that if you file the wrong paperwork, the case could be dismissed and you may need to refile. This sort of mistake can can get expensive! If you hire Attorney Jacobs when you are filing for Divorce in Orlando, he will ask you questions about your marriage, assets, liabilities, kids, and expectations for how your case will be resolved. Many of these questions are intended to help Attorney Jacobs decide what type of divorce you need to file for. If you are doing this by yourself as a “pro se” litigant, it is important to read the directions on the Florida Supreme Court approved forms. There are certain checklists of documents you may need, and there are directions you may follow. Face it, this is not an easy process, and that is why there are experienced legal professionals that are ready to help. The Florida Family Law Rules of Procedure and Florida Statutory law require the petitioner (the first to file) to serve the other party with process. This means due process. Due process refers back to our constitutional right of notice and an opportunity to be heard. 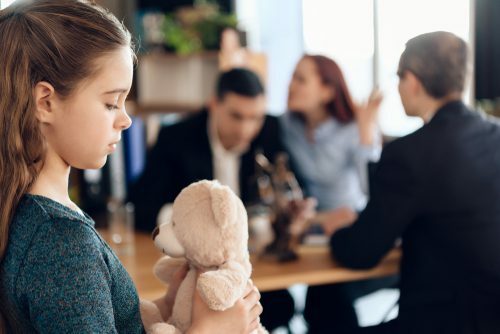 Florida is a no fault divorce state, meaning you have an absolute right to get a divorce with certain minor exceptions, BUT, there are procedural requirements, and service of process is mandatory unless waived. Filing For Divorce in Orlando means you may not serve the other party exclusively by certified mail or by regular mail, by FedEx or UPS. Rather, you must hire a process server and obtain an affidavit of service to indicate to the court that you have made diligent efforts to alert the respondent to the existence of the petition for dissolution. A primary issue in Filing For Divorce in Orlando is that both parties must provide certain financial and other related documents to the other party. This is called mandatory disclosure. When you are in the process of deciding whether your divorce will be contested or uncontested, you may want to consider how much you and your spouse want to quarrel over the distribution of your property (marital and non-marital). Mandatory disclosure typically includes bank statements, credit card statements, loan statements, financial affidavits, and other important documents. Many couples choose to obtain an uncontested divorce in Orlando. This is because a contested divorce can take longer, cost more in legal fees, and involve a lot of legal battles that can impact all parties involved. For instance, filing for a divorce with relocation with a minor child can be expensive. An uncontested divorce in Orlando means you and your spouse have agreed on all issues and are ready for Filing For Divorce in Orlando so you may also proceed to the final stages of your dissolution. In contested divorce cases, it is likely you will attend hearings, mediations, possibly some depositions, and in some cases, a trial. Although technically not an absolute requirement in all counties, in Orange County Florida, mediation is ordered in a majority of cases. Judges here in Orlando generally believe the parties should have the right of self-determination when filing for divorce in Orlando. Litigants should have a proverbial “bite at the apple” to resolve their case on their own terms before the judge becomes heavily involved in the case. This is a good time to answer a common question clients have when filing for divorce. “How do we choose a judge in my case?” Judges are assigned based on availability and dockets, not based on the unique preferences of the litigants. Orlando divorce lawyer Jonathan Jacobs is the managing partner with the Jacobs Law Firm, PLLC. When you are seeking a divorce in Orlando, call us for the information you need and the help you require.